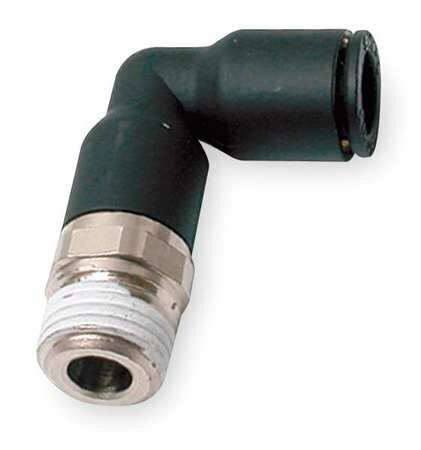 This Legris 3129 90-degree extended elbow is a nylon and nickel-plated brass push-to-connect fitting and connects tubing to a female threaded connection at a 90-degree angle with enough height to pass over a Legris 3109 series elbow. It has a female push-to-connect end for receiving tubing and a male National Pipe Taper (NPT) threaded end for connecting to female threaded pipes. The NPT threads create a tighter seal than straight threads. This fitting is made of nylon and nickel-plated brass — nylon for strength and flexibility, abrasion resistance, light weight, and resistance to crushing and cracking, and nickel plating on its brass sub-base for ferromagnetic and corrosion resistance, strength at high temperatures, and toughness and ductility at low temperatures. The fitting is suitable for handling pressures up to 290 psi (20 bar), has an operating temperature range of -20 to +80 degrees C (-4 to +176 degrees F), and has a vacuum capability of 755 mm Hg. This fitting meets Restriction of Hazardous Substances (RoHS) and International Organization for Standardization (ISO) 14743 technical specifications. This 90-degree extended elbow is suitable for use in air, water, oil, chemical, and food applications. Parker Hannifin manufactures electromechanical, hydraulic, and pneumatic motion technologies and systems for fluid handling, filtration, sealing and shielding, climate control, process control, and aerospace applications. The company, founded in 1918, is headquartered in Cleveland, OH. If you have any questions about this product by Parker Legris, contact us by completing and submitting the form below. If you are looking for a specif part number, please include it with your message.